If you’ve never used a hearing aid before, you may not be familiar with the process of getting the right device for you. After the hearing test and results, your audiologist will help you pick out the right device for your lifestyle, budget and hearing loss needs. Once you have selected the right devices, you’ll have a hearing aid fitting. This appointment is crucial to getting the right physical fit for your hearing aids, programming, settings and to learn proper care and maintenance. Your audiologist will use this appointment to physically fit your devices to your ear. This means ensuring that they are comfortable, sit securely in your ear and fit properly to produce the best listening experience for you. Be sure to discuss any odd sensations or feelings with your audiologist so they can make adjustments if necessary. 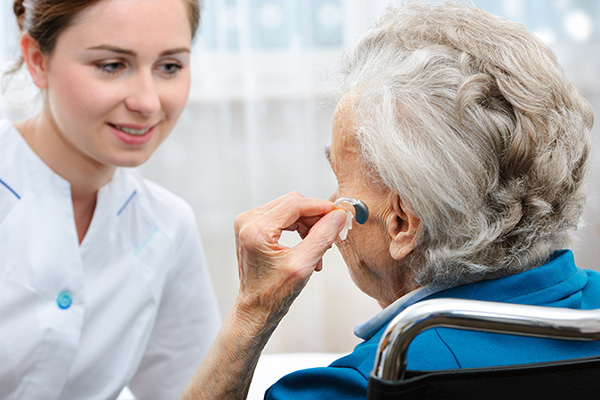 While fitting the hearing aids is a huge part of the appointment, you will also learn how to use them and take care of them. Both of these things are essential as you move forward with your new hearing device. If you don’t know how to do basic things, like turn the volume up or clean the device correctly, then you won’t get the most out of your hearing aids. During the appointment, your audiologist will conduct various sound tests. Mainly, they test how your ears hear different sounds with and without the hearing aid. Doing this allows the audiologist to program and tune the hearing aid according to your ears. Why is this so important? It ensures your hearing device will work in line with your specific hearing loss. Therefore, it becomes a far more effective tool and optimizes your listening experience in different environments. Finally, another benefit of this appointment is that it lets you ask any questions you have regarding your hearing aids. Whether it’s tips to help keep your devices in the best shape possible, how to adjust to hearing small sounds again or simply what to do if you experience any issues with your hearing aids, you’ll be able to discuss these questions thoroughly with your audiologist.